Medium Length Hairstyles for Women over 50 are considered as the best choices to age gracefully! When a woman crosses a certain age, she wonders which upgrades are required to keep her image respectable, decent, fairly youthful, elegant, not outdated, and stylish. Ladies who age gracefully, are always admired by everyone else around. A haircut is one of the key factors that shapes your image and style statement. Medium length haircuts are perfect for every lady and they are elegant for women who have just crossed 50. This length is long enough to look sassy and stylish but not very much longer to appear awkward for an aging lady. A haircut that lies between shoulders and chin is capable of allowing you to rock every event you attend. 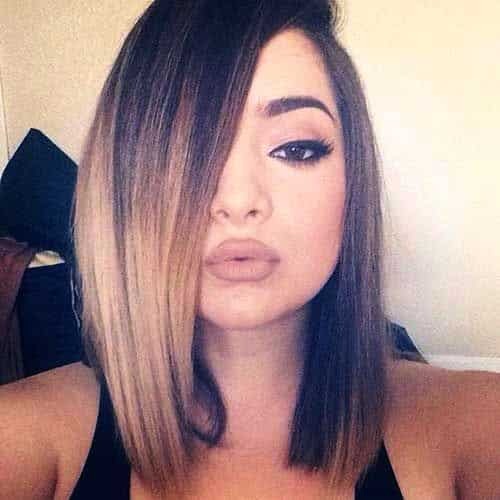 This length works well for everyone irrespective of the age, hair texture, face shape, and hair color. Furthermore, it always hits the style charts and is never out of trend and style. 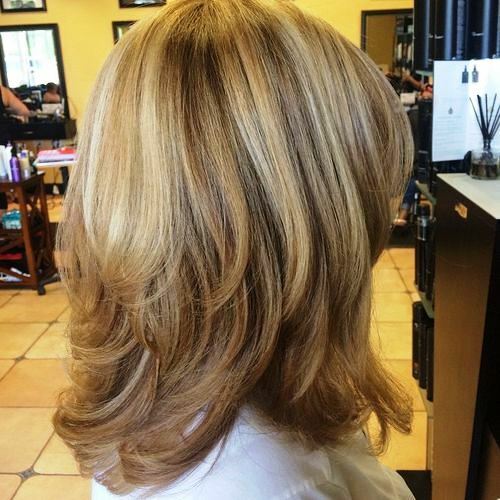 This medium length haircut with honey highlights and discrete layers just looks marvelous on fair skin complexions. To get this style, the top layers are kept shorter, whereas the long tresses touch the shoulder. It is one of the alluring Hairstyles for over 60. This hairdo looks great and also, it needs very less time to get styled. Use a round brush to style it and keep a side swept bang on the front side. 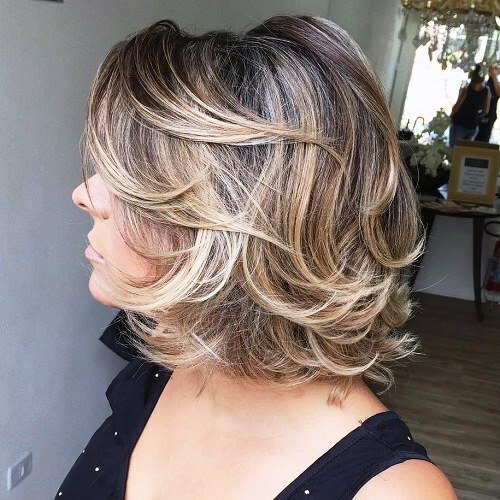 An adorable combination of soft highlights and layers makes you age gracefully. This hairdo is a nice choice if you are looking for some less maintenance Hairstyles for over 50 with Round Face. This haircut lifts up the looks as well as adding structure. It is a great complement for ladies with thick hair and round faces. Towards the front side, keep your hair a bit longer and ask your stylist to blend them into the rest of the hair. This feathered hairdo completely transforms your personality with a great delight. To give some volume to your fine and thin hair, a feathered layers haircut is a nice way. It helps to keep a youthful glow and requires very low maintenance. It is a nice pick if you want Medium Length Hairstyles for Women over 50 with a round face. 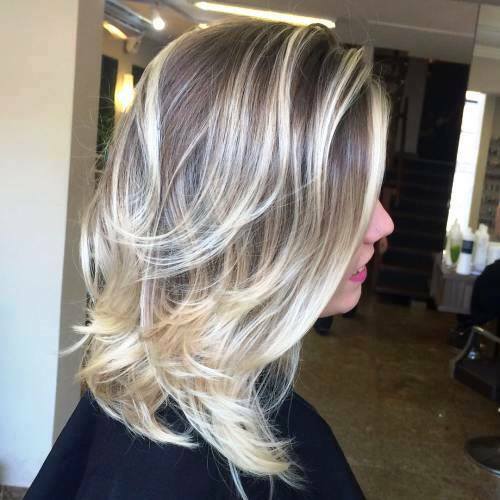 An addition of white blonde dye imparts an elegant and sophisticated look. Look at how gracefully these layers fall on the shoulder. It seems a complicated and difficult hairdo, but it is not. Tell your attendant at the salon to add feathery layers in your hair. While blow drying, always do it with a round hair brush and flick the hair ends. Finish this look with a good quality hair spray. Your age cannot decide whether you can wear a playful and fun hairstyle or not! There are so many options to manipulate Medium Length Hairstyles for Women over 50. You are not too old to add a fun and brightness factor into your personality. Impart some sassy layers along with the bright Balayage highlights to get ready for all kitty parties you are planning to attend. These days, Medium Length Haircuts for Women over 50 are blending the natural gray color with other trendy dye jobs. 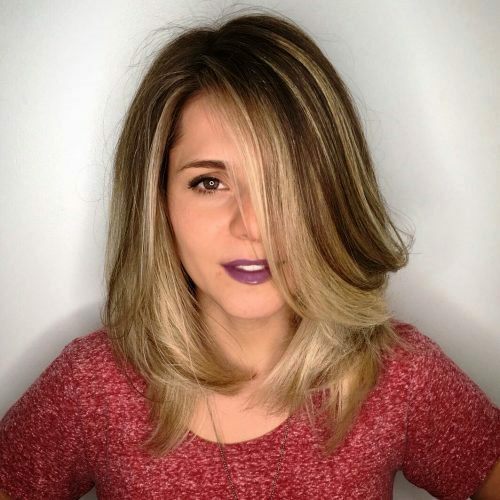 Try a Balayage scheme to blend your natural gray color with a darker brown blonde shade. Add long layers to create some softness and movement in your style statement. This air dried hairdo seems amazing when styled with a right brush to get a sophisticated polished look. To add a soft movement, comb your layers towards the back side. A subtle highlight makes a nice pair with this style. By your mid-length hair, you can allow your natural curls to fall freely on your shoulders. Further, to add the dimension and movement, use light blonde color dye to enhance the alluring look of your long layers. For a classic 70’s vibe, add a point-cut fringe in your ringlets. Flow and movement are two important factors while selecting Medium Length Hairstyles for Women over 50. 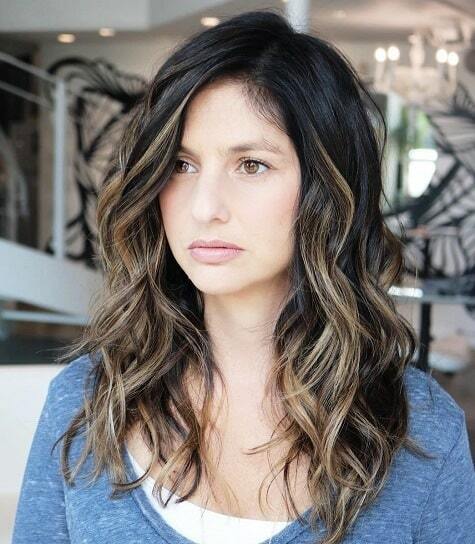 This medium length haircut with overlapping layers adds tons of movement to your dull and flat hair. These overlapping layers give a wave-like effect that is incredibly adorable. You are not going to spend much of your precious time to style it as it is an easy hairdo. 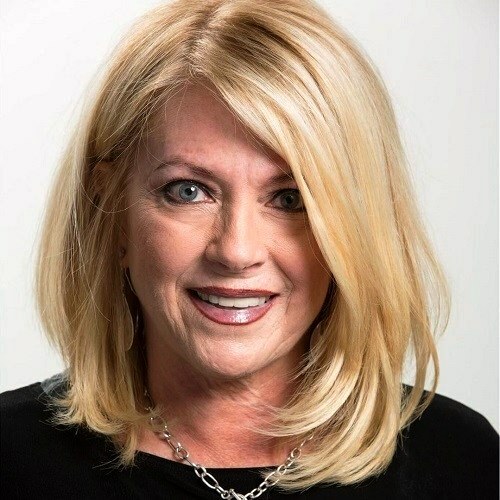 If you have fine and thin hair, then choose one of the Medium Length Hairstyles for Women over 50 which goes with your hair texture to get a voluminous look. To transform your lifeless and straight strands into edgy tresses, this wispy haircut is a smart pick. 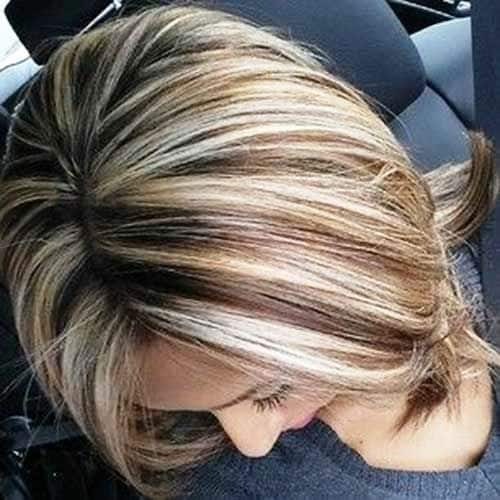 Blonde highlights are popular and make a good pair with Medium Length Hairstyles for Women over 50. 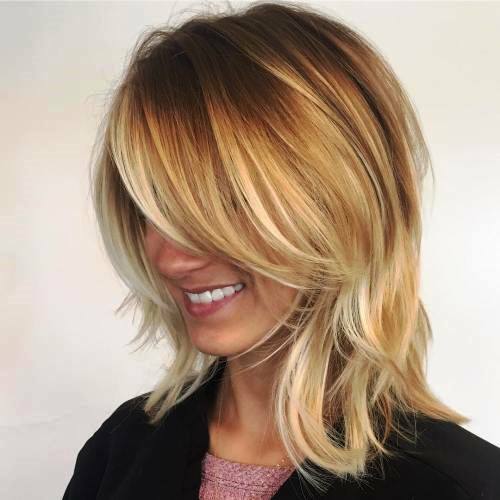 No matter what your age is, this butterfly blonde color dye looks amazing and imparts a youthful image. This hairdo gives a stunning look if you have maintained super healthy hair. Medium Length Hairstyles for Women over 50 are no more have to be boring, and this bombshell hairdo is a proof. This hairstyle with a spunky attitude is all set to pull off a funky personality of yours. 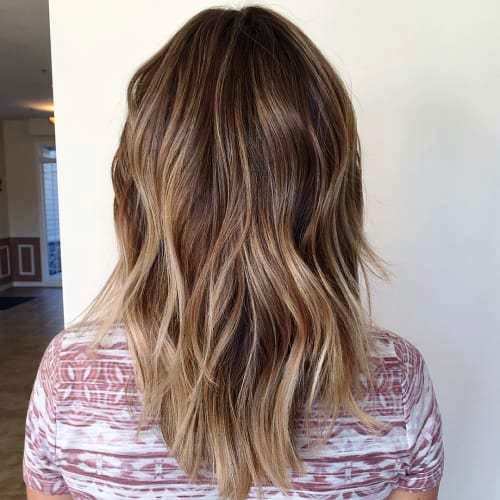 A blend of blonde highlights and a red base will for sure warm up the complexion. 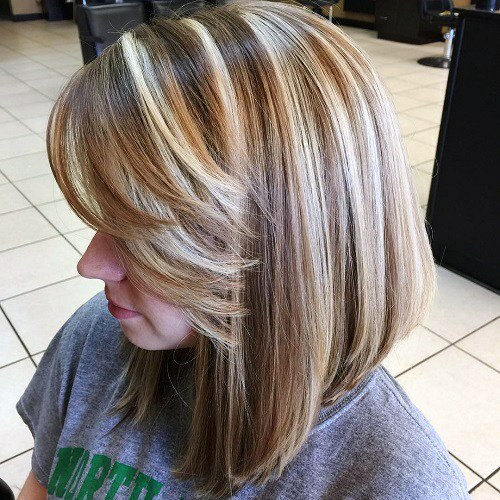 To brighten the personality, a haircut with side bangs and flicked out ends is one of the stunning way. Caramel highlights further enhance the hair look. Use a dark brown base to create a good contrast and nice visual appearance. This is one of the best Medium Length Hairstyles for Women over 50 that makes you look vibrant and young. If you are looking for Medium Length Hairstyles for Women over 50 for thin hair, then try out this one. The body building layers create the necessary volume in fine hair. 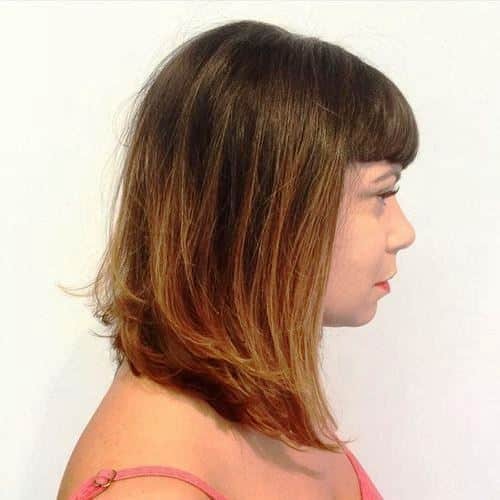 Pair these layers with bangs and further, tease the roots to create some movement. 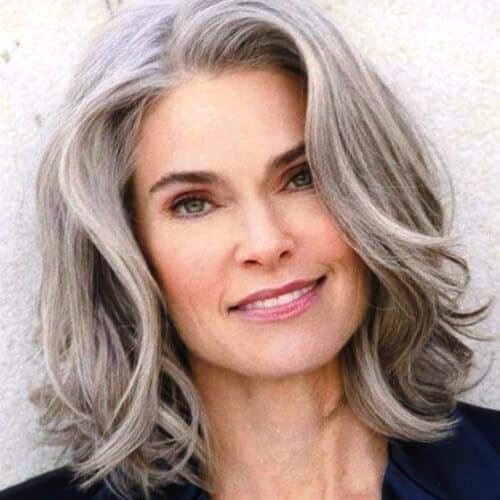 This is an effortless looking and an easy hairdo for women over 50. Use a good quality hair serum to make the style stay for a longer time period. 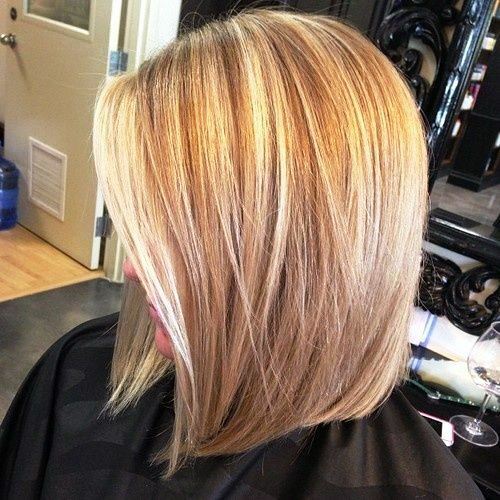 Try a long choppy bob and blend it with layers and a multi toned dye. 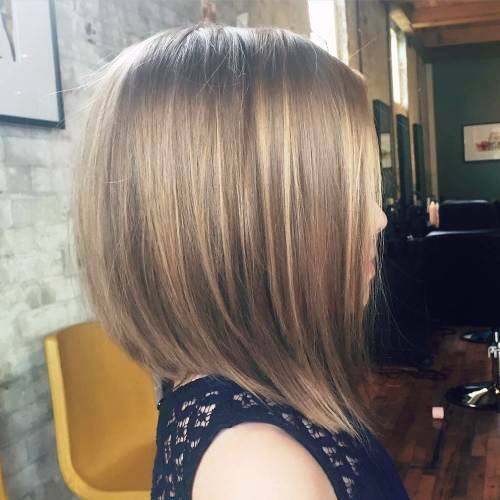 The layers will give a texture and pixie cut vibes to the long bob. Allow the teased layers to fall freely on the shoulders to give away some free spirit vibes. 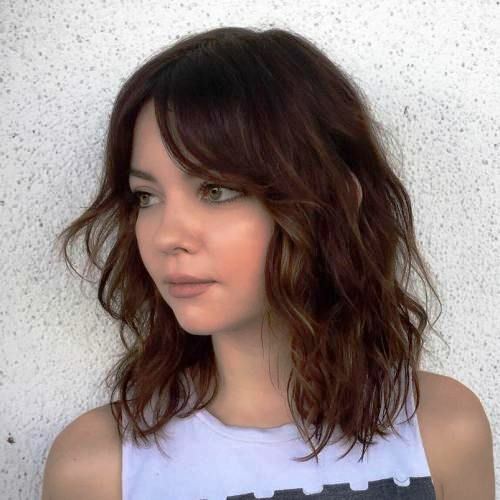 This look is perfect for you, if you want to have a nice blend of layers and bangs into your shoulder length hair. It leaves a full of volume and feminine look to the strands. The deeper layers are all set to create an amazing contrast with your complexion. 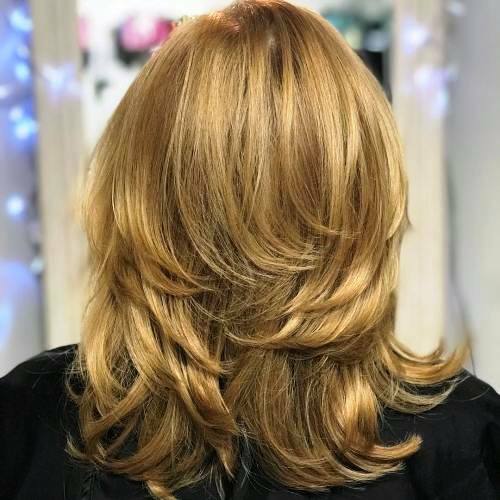 This lowlights and highlights in mid-length haircut is one of the perfect Medium Length Hairstyles for Women over 50 in terms of dimension and fullness. Soft layers with dark and light strands give an alluring feminine touch to your aging personality. Medium Length Hairstyles for Women over 50 work best for most of the hair types as they add grades to the locks. This off centered downdo frames the face very well. Very warm and faint highlights create an amazing sun kissed effect. This haircut takes your style statement in an elegant way. For square and round face women over 50, this haircut is an elegant job. Center parted waves gently kiss your cheeks. Further, caramel highlights will refresh the look and bring out your eyes color very well. 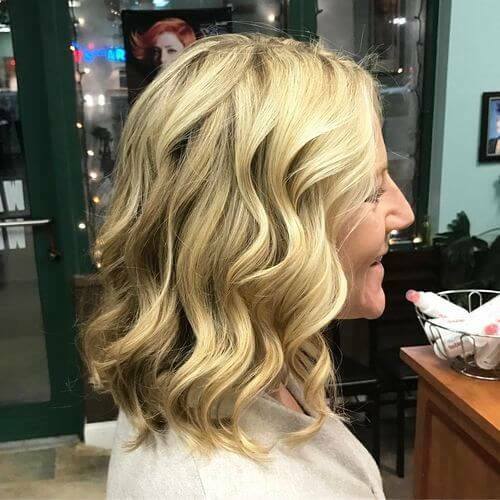 If you love to attend the parties, then this is one of the most elegant and glamorous Medium Length Hairstyles for Women over 50. For green eyes and a fair skin, this golden blonde highlight with pale ribbons haircut is quite complimentary. Long side swept bangs along with teasing and soft curls at the end speak elegance and glam fluently. This haircut adds so much sophistication to your thick hair that can never go unnoticed. Hence, it is a nice pick if you are looking for Hairstyles for 50 year Old Woman with Thick Hair. Another way of aging gracefully is to go for a natural hair color. Embrace natural gray color of your hair to flaunt it. By having a basic salt and pepper haircut with a gray color, any woman over 50 can get an adorable look. To further enhance the appearance, curl the hair edges inwards. If you have just crossed 50, then this haircut is very classy and easy to pull off. In this medium length brunette wavy haircut, you will see an elegant and glamorous look. The uneven hair ends make you to get a smart and messy appearance. The wavy texture also helps you to get an alluring image. To get most of this one of the most glamorous Medium Length Hairstyles for Women over 50, side part the front hair slightly. To get a smart and edgy look even at the age over 50, the straight and chopped hair at medium length is a nice option. The edges of the hair make you appear bold, appealing, and smart. The choppy texture of super sleek hair builds necessary volume if you have thin fine hair. 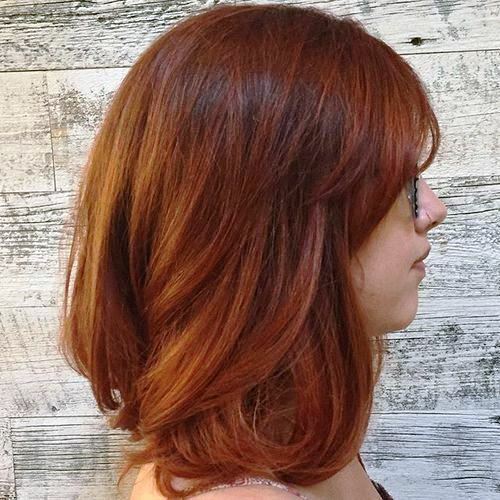 The side swept bob further adds an appealing factor in this haircut. When styled properly, natural wavy hair looks just amazing. 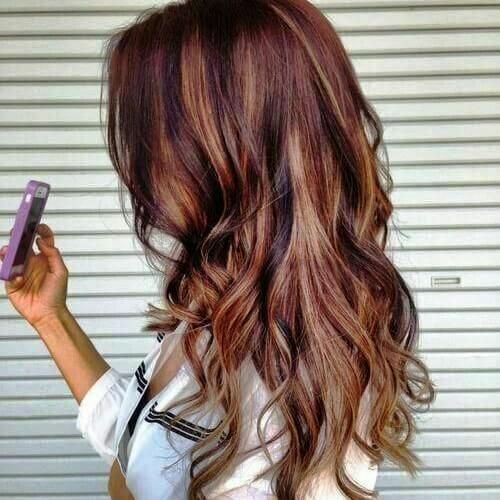 If you have wavy hair then, opting side parted ombre wavy haircut is a nice pick for the upcoming makeover. By keeping the hair open and flow freely, you can further flaunt your curls or waves. To keep the tresses in position, use of clips or pins will do the right trick. A side swept Flippy lob looks stunning on women who have just crossed 50 and want to still look stylish. 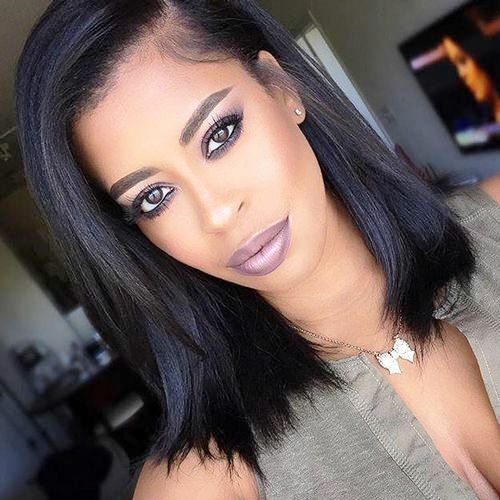 This hairdo looks equally good on ladies with curly, wavy, or straight hair types. Allow one segment of your front hair to fall on one side to mask your brows in an adorable way. Just because you have just crossed 50, it doesn’t mean you have to get out of style. There are no more such rules for mature ladies these days. In these years, you can still wear curled, straightened, pulled back, or long hair in a very elegant way. 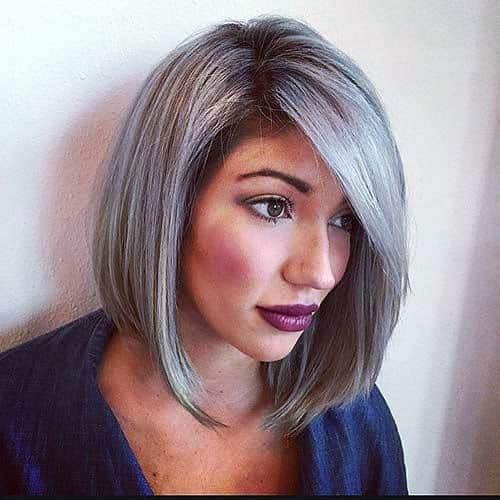 The Medium Length Haircuts for Women over 50 featured above are all absolutely gorgeous. Each haircut looks good for specific hair texture and face shape. You can choose which one suits you as per your style taste. Older Hollywood celebrities such as Lisa Rinna, Kim Basinger, Sharon Osburne, Kris Jenner, and many others have shown us that how stunning and graceful a woman can look even after 50.